The final game of the Nations Cup competition Cologne what the tournament decider. Gliders by more than one point to take home the Nations Cup, while Australia Gliders just needed a win. Germany started brightly finding ways to break the Australian press and take a 6-0 lead, but the Australians tightened up their press defense which caused Germany’s problems and turnovers, which aided them to a 6 -point advantage at the end of the first half, 32-26. Germany won the third quarter, 18 -16, bringing the game back from a 12-point deficit to a four-point game with 10 minutes remaining. 48-44. In the fourth quarter, it was Germany’s teamwork that proved instrumental in their fight back, as all the low pointers worked tirelessly to get their forwards inside, of which they exploded to edge in front of 56-54, with just over three minutes remaining. Australia is looking forward to the free throw line to regain the end of the game, but the host nation was clinging to the free throw line, making 7 from 8 and securing the victory and the tournament, 67-60 . 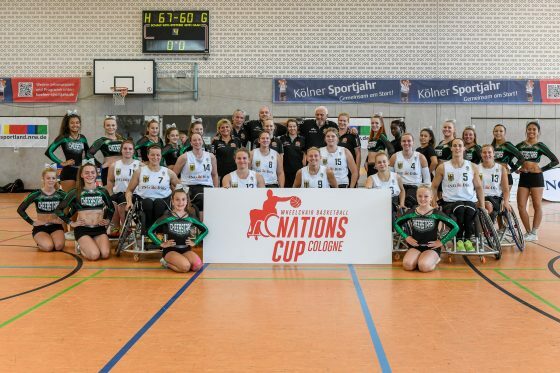 Congratulations to the German Women winners of the inaugural Nations Cup Cologne.